No one disputes that cancer-causing benzene, explosive methane and other hazardous compounds are present in the abandoned oil waste. But while Shell’s testers argue the chemicals don’t pose major health risks, residents and the investigators representing them say that people and pets have become sick and died from a spectrum of illnesses as a result of living in the community. Carson is on the verge of declaring a local emergency to spur more rapid cleanup of its environmentally contaminated Carousel housing tract, which sits on a former oil tank farm that left untold amounts of petroleum just a few feet below the neighborhood’s 285 homes. The city filed a claim for damages this week in Los Angeles Superior Court, alleging that Shell Oil Co. is trespassing and creating a public nuisance that is causing injury. On Thursday night, council members told staff to prepare an emergency resolution seeking immediate remediation of the problem. It isn’t clear how the regulatory agency overseeing the cleanup — the Los Angeles Regional Water Quality Control Board — will respond to Carson’s declaration. Officials have known about the problem for five years and, as it stands now, actual cleanup won’t begin until next year at the earliest. The council will consider adopting the emergency resolution at or before its Aug. 6 meeting, Repp-Loadsman said. Two years ago, the regional water board ordered Shell to clean the soil to a depth of 10 feet below the residential community. Since then, the company has conducted extensive testing inside homes and below ground to determine whether the oil is turning into hazardous vapors. The oil was discovered during soil testing in 2008 near the 50-acre community on the city’s southernmost boundary, near Wilmington. Soon after it was found, Shell investigators began tests to determine how bad the contamination was. The crude stems from the tank farm that occupied the land from the 1920s through 1966, when construction began on the Carousel tract. Shell used the area to store crude oil and, when the company vacated the property, it demolished oil reservoirs and left the rubble and waste petroleum in the ground. Though the tanks reached a below-ground depth of roughly 10 feet, the oil has leaked at least 50 feet below ground, investigators said. Since 2008, residents have been warned not to let their children play in backyards. Rigorous testing has temporarily displaced homeowners while investigators take over their homes to test the air quality and sub-slab vapors. In the past year, Shell’s pilot tests have dug up front yards, exposing smelly, oil-soaked soil. 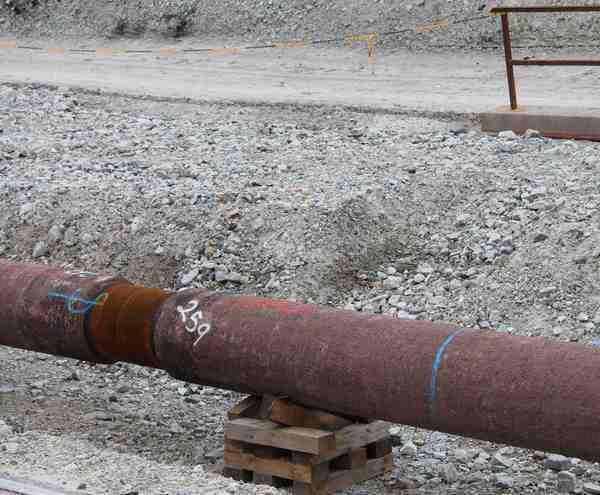 The water board has required Shell to submit a so-called Remedial Action Plan by the end of this year to outline the steps it will take to clean the soil and its time line. The actual cleanup is scheduled to begin once the water board approves that plan. However, attorneys representing the residents and the city argue that Shell’s tentative plan to clean soil to a depth of 10 feet below some homes — and only on land that isn’t developed — is extremely flawed. The July 16 complaint was filed on behalf of the city by Girardi and Keese, the same law firm representing residents suing Shell. Girardi and Keese and its investigator, Erin Brockovich, battled PG&E in a contamination case involving the desert town of Hinkley, Calif., that was dramatized in a 2000 feature film. Bob Finnerty, an attorney with Girardi and Keese, said several complaints have already been filed on behalf of 1,008 clients who say they have been physically and financially harmed by living in the neighborhood. This week has seen large numbers of people continually walking down to Shell’s tunneling compound, disrupting work and blocking Shell traffic, and many people from the camp have taken advantage of the sunny weather to spend the days helping locals with turf collecting- many hands make light work! Meanwhile the guards have spent their time patrolling around harassing people on the roads. Thursday morning as a convoy passed the camp, 20 Gardaí tried to block the gate to the camp and threw people into ditches, pushing one person’s head into the water in the ditch and generally being a bit violent. Two people were arrested. One was let out with a caution and the other was held in custody, brought to court in Castlebar Friday morning and denied bail, so he is now in Castlerea Prison awaiting a court appearance 5th July. 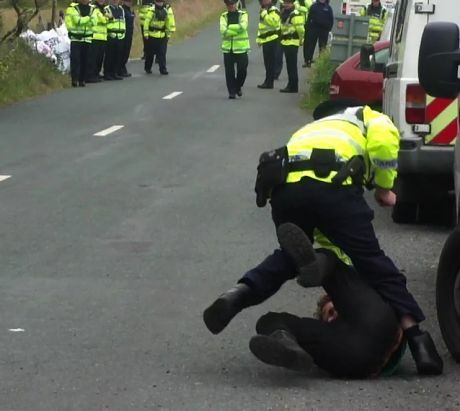 Later on Thursday morning a small group went to Belmullet Garda station to collect their friends and one person was dragged outside the copshop, pushed to the ground and arrested for alleged criminal damage on Sunday 23rd June. 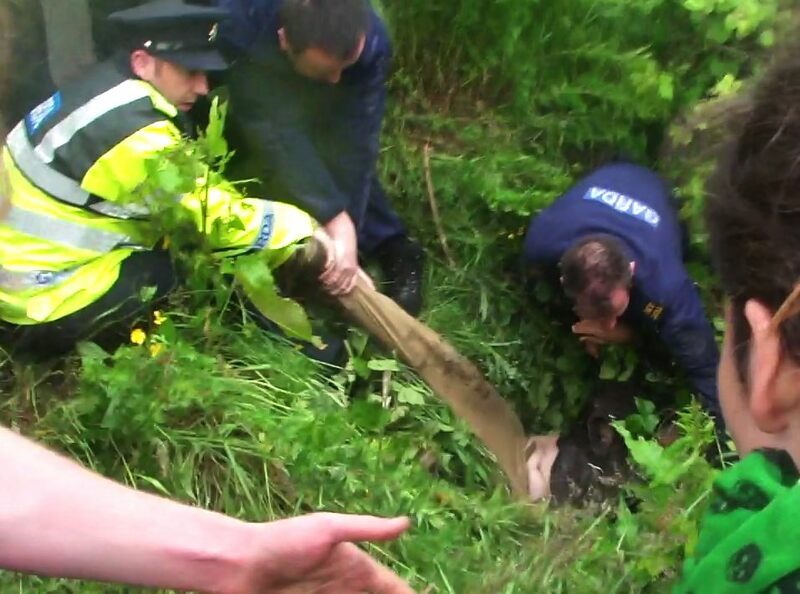 He was held overnight and brought to court in Castlebar on Friday morning. 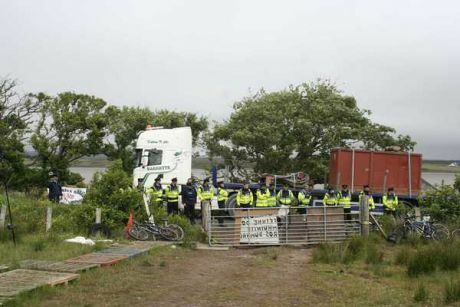 He has been granted bail and released on the condition he not enter or interfere with Shell property or traffic, and signs on once a week at Belmullet Garda Station. He will be up in court on 10th July. Thursday afternoon a large group of 30 or so people walked down to the Shell compound in Aughoose, stopping work inside the compound and stopping any Shell traffic from entering or exiting the compound for over 3 hours. Once again IRMS (Shell private security) was policing the public road, pushing people and holding people until the guards arrived. Two people were arrested on the road. One person was released and will appear in Belmullet Court on 10th July, the other was arrested for outstanding fines and brought to Mountjoy women’s prison in Dublin. She was held overnight and released Friday morning. Thursday finished off at 6pm when the guards finally attempted to clear the road, everyone left and no one else was arrested. A long queue of 20 vehicles and lorries which had been stuck inside finally were able to leave the compound. Friday 28th June at 7am one person climbed a tripod erected in the road between Bellanaboy refinery and the Aughoose tunneling compound, stopping all traffic going into the compound until 11.30am when the road was cleared and the person was arrested. That person is being charged with Sections 8 and 9 of the public order act and will be up in Belmullet court on 10th July. Three people walking back to camp from the tripod on Friday were followed by guards, and an attempt was made to arrest one of them but they jumped into a field and got away. This isn’t the first time that people have been harassed on the roads this week by Gardaí. Tuesday night as people were walking back from the pub the guards were stopping people who were walking in twos or alone, asking for names addresses and even emails. One person refused to give his details, saying he hadn’t done anything out of the ordinary and was only walking home, and he was arrested and brought to Belmullet garda station. He was released in the early hours of the morning with no charges. Other things that have happened this week: Windows of a Shell house were broken, graffiti appeared on the main gates of the tunneling compound, and a Shell truck ran into problems with spuds up the exhaust and someone doing in its tyres. Who knows what else the pixies have gotten up to…. via Gardaí frustrated as protests in Mayo continue – Indymedia Ireland. Oil company Shell will resume talks next week in London with lawyers representing 15,000 of the poorest people in the world who are claiming millions of pounds’ compensation for oil spills on the Niger delta. But Martyn Day, of Leigh Day law firm which is acting for the communities, said the case could still go to a full high court trial in London in 2014. The Shell petroleum development company of Nigeria (SPDC) has admitted liability for two spills from a pipeline in the Niger delta in 2008, but the company disputes the quantity of oil that was spilled and the damage that was done to livelihoods and the environment near the coastal village of Bodo in Rivers State. Oil spill experts working for the communities estimate that nearly 500,000 barrels leaked from the company pipeline over several months, Shell claims it was far less. The legal action, represents the first time Shell or any oil company has faced claims in the UK from a community from the developing world for environmental damage. “We have agreed to negotiate over the next two to three weeks. Probably the talks will go on into the autumn when a deal will become more likely,” said Day. The legal development came as Netherlands National Contact Point(NCP), which oversees the implementation of OECD guidelines on the human rights and environmental records of multinational companies, broadly backed claims by Amnesty International and Friends of the Earth International that Shell’s repeated assertions that sabotage is responsible for most of the oil spilt in Nigeria is based on flawed investigations which rely on information provided by the company itself. The two organisations offered NCP video evidence of “serious flaws” in the system used by Shell for investigating oil spills. NCP accepted there were problems in the spill investigation system but criticised Shell. “Shell management should have had a more cautious attitude about the percentage of oil spills caused by the sabotage. The data they are based on is not absolute,” it said. Shell replied that oil companies did not devise the investigation system and that they had acted within the Nigerian law. “Any spill is a serious concern, and SPDC staff and contractors are working hard to eliminate operational spills. Unfortunately the high incidence of oil theft and illegal refining in the Niger delta exacerbates the problem and has a devastating impact on the environment. This criminality is the real tragedy of the Niger delta. SPDC regrets that some NGOs continue to take a campaigning approach rather than focusing on on-the-ground solutions that bring societal benefits,” said the Shell spokesman Jonathan French. Shell’s 2012 sustainability report states that 95% of the 26,500 barrels of oil spilled from Shell facilities in Nigeria which were as a result of sabotage. Of the 173 oil spills over 1.5 barrels from SPDC facilities, the company said 80% were caused by illegal activity.